Which is the young man who, seeing a woman who has a nice roundness behind, has not run immediately ahead to see her face? Which of us all is not seduced by the elegant roundness of a young woman, or even a young man whom one has only seen from the back? It is thus more important that we would have thought first to represent a woman who must be seen from behind; were it only to see if her dress made a good effect. One cannot deny that the redingote that the Woman represented in PLATE II wears perfectly fits her shape, and hangs agreeably to her heels. All is fine, all is wide, all is smooth as a whole. The bust is very svelte. The arms are well rounded, very supple; nothing is constrained, nothing is narrow, nothing is strangled. 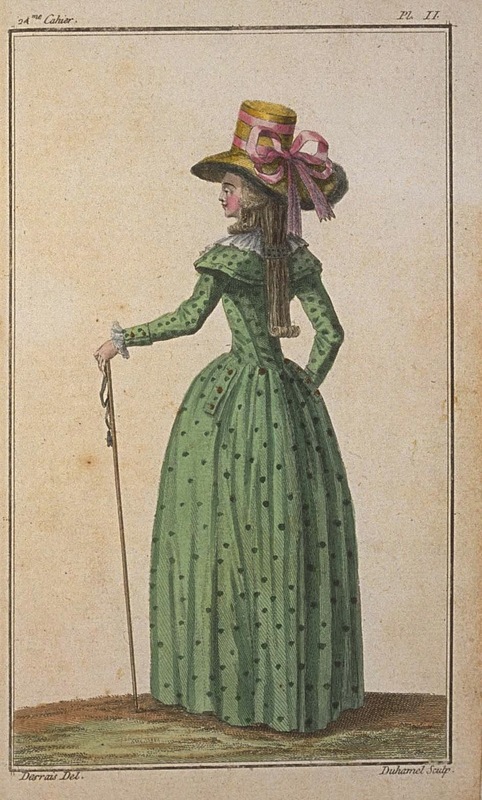 The redigote, with two collars and sleeves à la Marinière, is of water green cloth, spotted with a darker green. The buttons applied on the pockets, sleeves, fronts, and hips, are gilded copper, all plain. The Woman wears on her neck a full kerchief of gauze, puffed very-high in the front. Her hair is done all in curls, of which two fall on her chest. 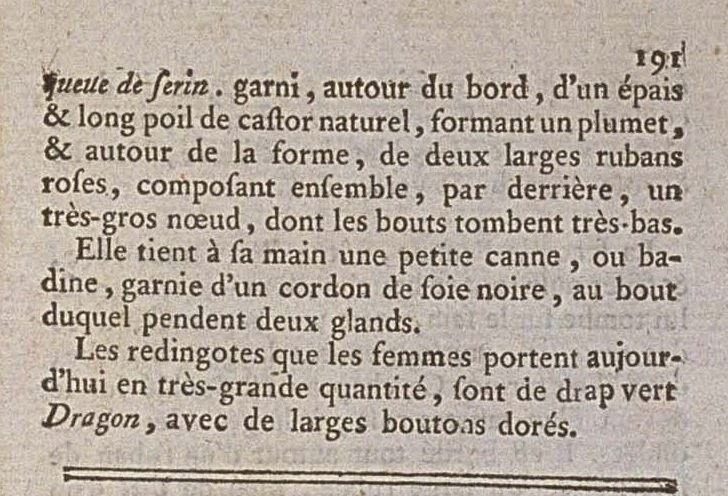 In the back, her hair, hanging à la Conseillière, is tied, below the level of the neck, with a large pin à la Cagliostro, chased and engraved in points. 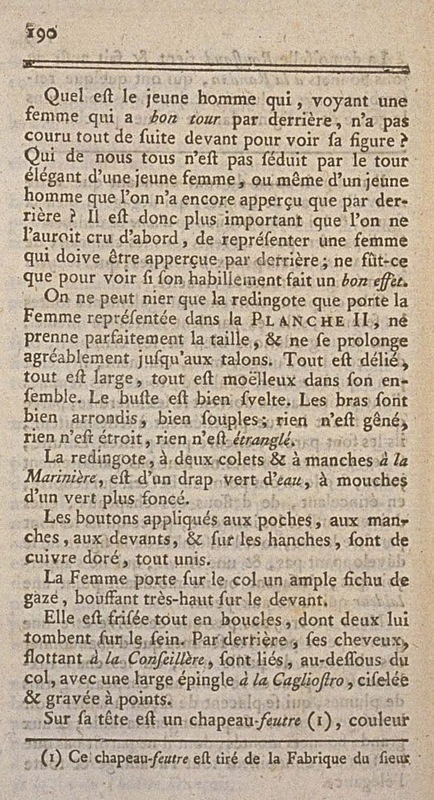 On her head is a felt-hat (1), canary's tail color, trimmed, around the edges, with an épais and long hair of natural beaver, forming a plumet, and around the crown, two wide pink ribbons, composing together behind a very-large bow, whose ends fall very-low. She holds in her hand a little cane, or badine, trimmed with a black silk cord, at the end of which hang two tassels. The redingotes that women wear together in very-great quantity are of Dragoon green cloth, with large gilded buttons. (1) This felt-hat is drawn from the Workshop of M. DONNET, Merchant Hatmaker, rue Saint Honoré, near that of l'Echelle; he is the author of this new mode, and furnishes the best made and best conditioned.